I got my Australian Shepherd at two months old, I think (or ten weeks? I can't remember). He is almost 8 months old now and neutered only a week ago, but ever since I got him, he has been randomly aggressive. When he was very young I had so many scars on my arms that you could barely find skin that wasn't destroyed. But it isn't constant, at night he really likes cuddling (though he is crated overnight) and he can be the sweetest thing. When we take him to the park he is extremely friendly, we heavily socialized him and he never treats strangers or friends badly. Just us at home, and only at home. We were told he might be trying to dominate us, and our obedience trainer and the breeder told us we need to grab him by the scruff and tell him no when he bites. This made him bite less but it has gotten worse recently with the new addition to the home. We have the new house member feed him by making him sit and wait until we allow him to eat, we have him exit doors first with the dog following... we've read all this stuff and we have been told what to do but nothing works. We tried saying "ow" when he bites but that just led him to get excited and bite more. Often times it is playful, but it's frightening. His tail will wag but he darts in and out until he draws blood. Aussies are very intelegent and will quickly try to be the alpha! I have two female, litter mates almost 6 years old. Not sure this is the same thing but I would sure try it. With both of mine, at different times and ages, I had to establish who was the alpha. I took them by the scruff, flipped them over on their back and held them down, scolding at first and then just holding them. They will struggle, but hold them down until they concede....you are the alpha. I'd be very surprised if it doesn't help. Your Aussie is getting away with this biting and it can't be pleasant. It's not all in fun if he's drawing blood! That is not play and I wouldn't wait any longer to try this the next time there is a biting or an aggression episode. It disturbs me that being the intelegent animal that they are, without the correction of wrong, they will continue and will not be all they can be. They are smarter than a lot of people I know. Seriously...they are. I talk in full sentences to ours and they are right there to do what I've said! 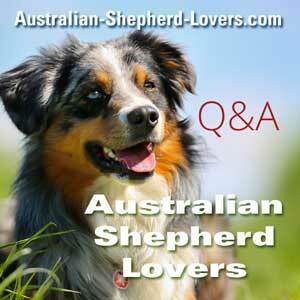 I love Aussies, I'm 74 yrs old and I will have Aussies as long as I can. They are a gift from God to teach people how to treat each other!!!! Good luck. Jade, I can remember the pain and frustration you feel. Our 16 month old did the same kinds of things that you described. I did my level best to maintain a positive attitude (that's not my normal M.O.). Aussies are so intelligent and I believe they know when they've frustrated you and/or you're mad at them (it was almost like she fed off of my frustration before I learned to control my emotions - this dog has been good for me in so many ways). I've read that you're not supposed to do the Alpha Roll (grab them by the scruff of the neck, flip them over and hold them there until they submit) but I did and I believe it worked. I'm not saying it didn't take time but one day it was just like a light bulb went off and she got it. Today we regularly play rough (not really rough but more like pushing and wrestling). She's gentle and stops when I say it's over. Hang in there and be consistent. He'll get it. With my Riley, I do correct him in such a manner... I have pinned him down every time he bites me, ever since I got him... It has shown nothing at all... In fact tonight he just refuses to concede. I pin him down over and over and he goes right back to the same type of biting. I just don't understand, I've tried everything like that exactly, and I'm very firm. I do not struggle with trying to show alphaship. He just does not seem to care? Many Aussies DO NOT respond to negative training. I was told to do the hold down with my girl at 10 weeks when she would jump at me and nip. I was at my wits end. I found a positive trainer and what an amazing difference. She responds to positive training. You cannot expect all dogs like people to all respond the same way. I have a very dominant female BUT I found that rewarding the good behavior made her want to do more. The puppy nipping is so common and I would say ouch and then ask for kisses. When she kissed she got rewarded. She was sensitive and to this day responds horrible if she is disciplined negatively. Aussies WANT to please. learn what works for your dog. Think about how kids respond to negative training. Try rewarding and praising good behavior and see if you can turn the behavior to what you want.